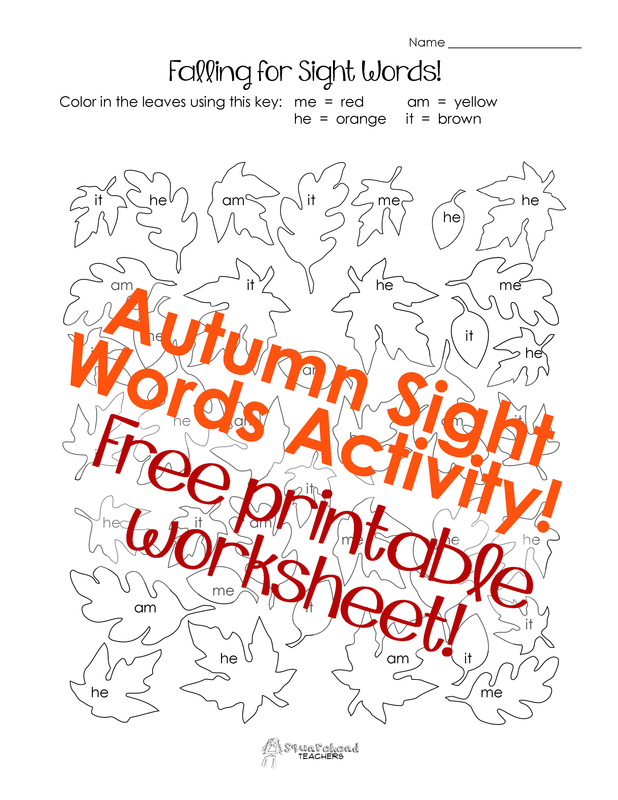 I haven’t done much with sight words on this blog so far, so I thought I’d take advantage of the fun Autumn leaves and make a fall themed sight words worksheet for kindergarten or preschool. I suggest having the student color the word “yellow” with a yellow crayon and “orange” with an orange crayon, etc. This way, they can still do the activity even if they haven’t mastered color words yet. This is a great activity for fine motor skills to color in the irregular-shaped leaves. Enjoy! This entry was posted in Halloween, Holidays/Seasons, Language Arts, Thanksgiving/Fall, Word Study/Spelling and tagged autumn, Children, Education, Elementary School, fall, Homeschool, Kids, kindergarten, language arts, preschool, sight words, Teacher Resources, Teachers, Teaching, Thanksgiving/Fall, word study by Squarehead Teachers. Bookmark the permalink.